Governor of Akwa Ibom State, Udom Emmanuel, has admonished people of the state to expect God’s divine power and glory in individual and collective needs in 2019. Governor Emmanuel made the call at a thanksgiving service in Latter House Chapel, Governor’s Lodge, Uyo. The governor was accompanied by the first lady of the state, Martha Emmanuel and deputy governor of the state, Moses Ekpo. The thanksgiving service to mark the end of 2018 saw Governor Emmanuel appreciate the efforts of Christian groups and clergies for their endless prayers and fasting for the state, testifying that God had protected and promoted the projects as well as programmes since the inception of his administration. The service had in attendance public office holders in Akwa Ibom and featured prayers of supplications, confessions, songs and testimonies from the people. The Governor encouraged the people to remain faithful to God in the New Year in order to cancel plans against them and subdue conspiracies against the state in the election year. 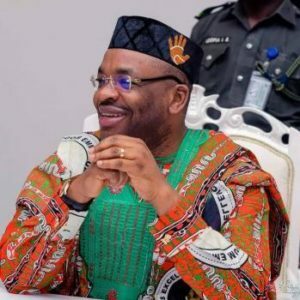 In a separate statement released by Akwa Ibom State Commissioner for Information, Charles Udoh, Governor Emmanuel also expressed his delight to witness God’s intervention in challenges faced in the state through the years, believing God’s faithfulness and promise for attaining goals in 2019. This entry was posted in Belief, Politics and tagged Akwa Ibom, New Year, Udom Emmanuel. Bookmark the permalink.